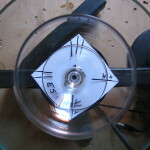 Kosmische Glass began as a simple experiment after Brighton’s Beatabet collective invited TD to propose a new sound work for their 2010 WTF festival. 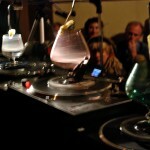 This prototype performance consisted of 4 adapted vinyl turntables each spinning a cognac glass against a friction arm (see friction idiophone) was well received by an audience sheltering from the August rain falling over Falmer, a typically beautiful rural village set in the rolling Sussex downland. Proto-KG was born. As it transpired, this initial performance was only a first step towards a developing aim, to build a fully chromatic instrument, an autonomous machine capable of resonating 12 water tuned glasses. The first issue was sourcing glass suitable for the project, good quality glass is fast to sound and easily energised to full resonance, oscillating at rates between 300Hz to 1200Hz. They would also need to populate a pitch range of two octaves (D4 to D6) We found vintage cognac glasses worked well, having a low centre of gravity and being manufactured to a higher quality, their varying sizes would also help fulfil the range of notes required. 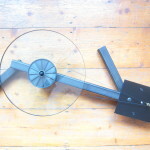 Next came the question of how to best approach building the hardware to spin glass, a real breakthrough came after a chance encounter with Rob Noble, head of marketing for UK record deck manufacturer Rega Ltd. 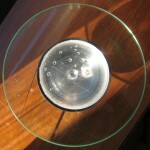 Rob very kindly arranged for sets of glass platters and spindles to be sent over to us from their manufacturers, for gratis, a truly altruistic gesture on their part for which we were truly grateful. 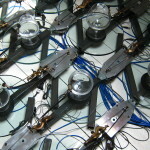 Perhaps the most challenging aspect of the project was designing the method to control the glasses as an automata. We opted for a midi (musical instrument digital interface) based system, where midi note on/off messages trigger switches supplying mains power each motor. 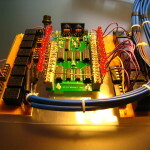 This meant constructing a control box capable of receiving external midi data, analysing it, then sending the appropriate messages to each corresponding glass. 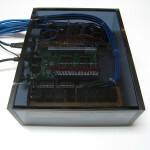 After a few initial prototypes failed, the eventual design for the glass controller was built by Gerald Smith of dot.works using j-Omega Electronics superb Midi to Parallel conversion cards. Finally, we addressed the need for sound reinforcement. While KG is primarily an acoustic instrument, it was decided to add support for recording and live Public Address. 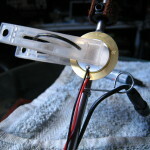 So, the last phase of work was to add discreet balanced wireless microphones and piezo elements to the friction arm. By mid 2014 we were finally ready to exhibit.